This material is intended for clinicians . See also: main VHIT page, and the vhit-conflict page. The VHIT is an instrumented bedside technique used to diagnose reduction in vestibular function in one ear vs. the other. As of 3/8/2018 we had done 1161 VHIT tests at Chicago Dizziness and Hearing, and we have run into a modest number of technical issues. Although we have both of the most common types of VHIT devices, we almost only use the interacoustic version (i.e. German version). This is the one on the left. There are a LOT of technical problems here - -one cannot really learn the VHIT in 30 min or an hour. One can get the general idea, and then one needs feedback from an expert for about 20 tests. While we are discussing problems here, I want to be clear that we think the VHIT is very useful, and especially it is good at detecting vestibular neuritis as well as bilateral vestibular loss. 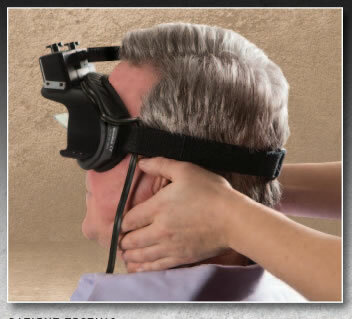 It is better than the rotatory chair for detecting vestibular neuritis. It is worse than the rotatory chair for bilateral loss. It is not really a good test for normal subjects, as it only assess the high frequencies. The rotatory chair does a better job. 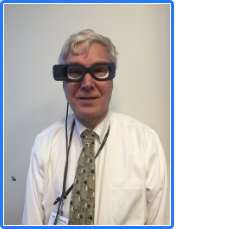 Dr. Hain modelling the GN-otometrics VHIT device. (Branded "Impulse"). Micromedical VHIT device -- looks just like their regular VENG goggles. This is branded "VisualEyes". Certainly the biggest problem with the VHIT is that the goggles may not adhere firmly to the face. There are a lot of moving parts here, and they don't always stick together. When the head is thrust one way, the camera tries to stay behind due to inertia, and thus the eye velocity can be wrong as the camera bounces around on the face (I am exaggerating). When severe, this can cause a problem where the eye and the head are not lined up in time. They come together at the end, this presumably happens as the head and goggles separate and then rejoin company. Usually this causes a too high gain problem. One knows that this is impossible because there are no corrective saccades. One also knows that this is impossible because almost nobody has a VOR gain of 1.2, and this is commonly seen. The GNO goggles have this problem in some people and in just one direction (because of the nose). The GNO goggles are much heavier than the interacoustic goggles and have a lot of weight eccentrically, which causes the goggles to slip more in one direction than in the other, and causes the VOR to the left to be wrongly low. It can be difficult in controlling the head, and not uncommonly, the head rebounds back after stopping. This is a very common technical problem. If the head does not get up to high speed (e.g. 240 deg/sec), the sensitivity of the test is much lower (Kim et al, 2018). This can be a problem with overly cautious or incompetant testers, or patients who have stiff necks. Goggles that are very heavy make it more difficult to get high speeds. Note that the interacoustic goggles are the lightest. Similarly, the gain may be too high, but there is no backlash pattern. We PRESUME that this is also due to goggle slip, but we are not sure. This pattern is VERY COMMON. VOR gains are often about 1.2. One knows that this is impossible because there are no corrective saccades. It has to be technical. See the main VHIT page for what others report about too high gain -- actually the gain is all over the place -- both too high and too low. So there are substantial technical issues with these things. Practically what this means is that the norms for VHIT, in practical clinical situations, have to be rather broad. The clinician must rely on the corrective saccades to validate the test. If a patient is told to look here, and actually looks there, the traces will be very odd because there will be corrective saccades based on the wrong position offset. This is rare. Occasionally, patients with cataract surgery, will have very noisy VHITs, presumably from camera tracking issues. For these patients, the test is basically useless. If you think doing a VHIT is hard with the horizontal plane, just think about the vertical oblique plane. The camera above is eccentric to the center, so if you rotate the head through the plane of the camera, it will bounce around even MORE. 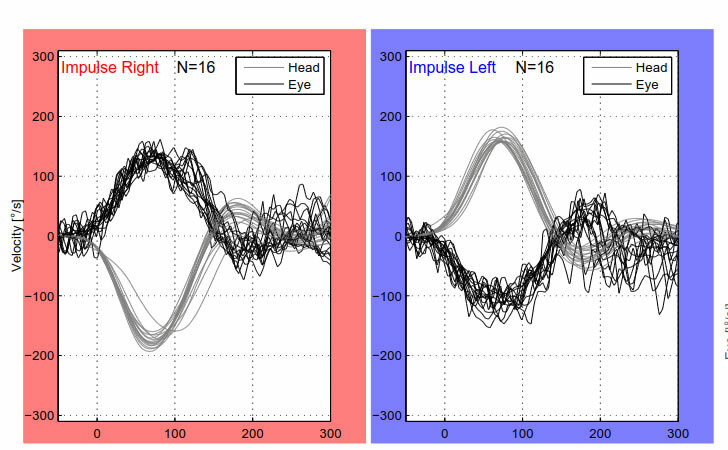 As torsional eye movements are not recorded in the VHIT, it all becomes so much guesswork. We don't think the 3-axis VHIT test really works. Janky KL, et al. 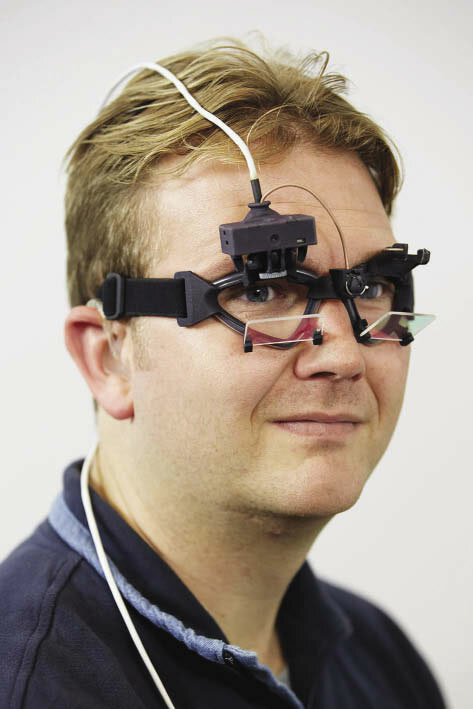 Effects of device on video head impulse test (vHIT) gain. JAAA 28:778-885 (2017). Kim TS, Lim HW, Yang CJ, Kim YH, Choi WR, Kim YR, Park JW, Kang BC, Park HJ.Changes of video head impulse test results in lateral semicircular canal plane by different peak head velocities in patients with vestibular neuritis. Acta Otolaryngol. 2018 Sep;138(9):785-789. doi: 10.1080/00016489.2018.1481523. Epub 2018 Jul 17.